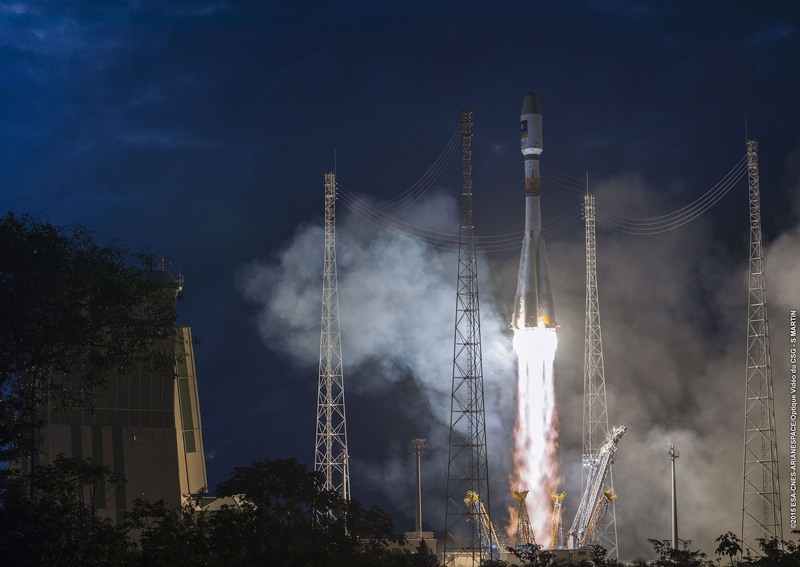 A Soyuz rocket has been assembled for launch from the Guiana Space Center on Tuesday, set to lift the next two Galileo satellites into orbit in the continued deployment of Europe’s Navigation Satellite Constellation. Liftoff is planned for 8:48 UTC with Soyuz completing a standard nine-and-a-half-minute climb before its Fregat Upper Stage takes over for the remainder of a three-hour and 48-minute flight to Medium Earth Orbit over 23,000 Kilometers in altitude. Europe’s global navigation satellite system, named in honor of Italian astronomer Galileo Galilei, began deployment in 2011, after over a decade of development and in-flight testing. 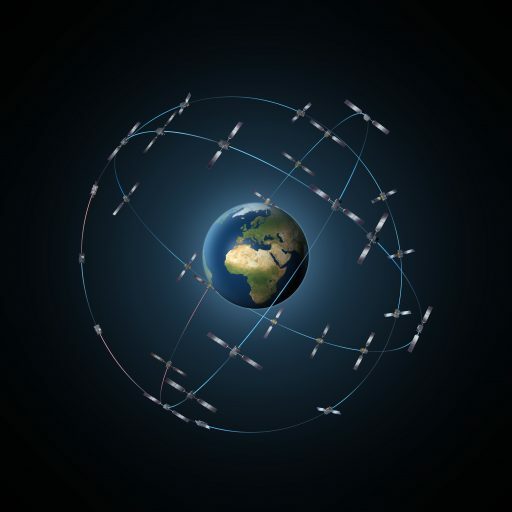 Similar in architecture to the American GPS, the system operates 30 satellites from three different orbital planes, ensuring global round-the-clock navigation coverage. Deployment of the operational constellation began in 2011 with the launch of two In-Orbit Validation Satellites followed by another pair of IOV craft in 2012. 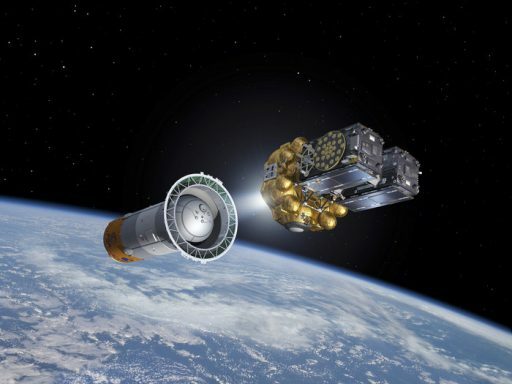 The third Galileo launch in 2014 reached a lower-than-expected orbit, requiring the satellites to expend much of their onboard fuel to reach a usable orbit. 2015 saw three Soyuz launches with Galileo satellites bringing the total number of operational satellites in orbit to 12. Tuesday’s VS15 launch marks the last planned Soyuz mission dedicated to the deployment of Galileo with subsequent launches switching to the Ariane 5 rocket that can lift four satellites into orbit. The first quadruplet launch is planned later this year followed by another two launches in 2017/2018 to bring the satellite constellation to operational strength. Tuesday’s mission was added to the Galileo launch manifest earlier in the year based on the readiness of the satellites and the desire to accelerate the deployment pace. 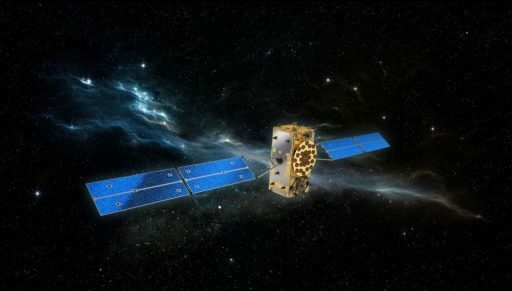 With four satellites flying on Ariane 5 in the fall, the Galileo constellation will enter its Initial Operational Capability, offering navigation services to customers. 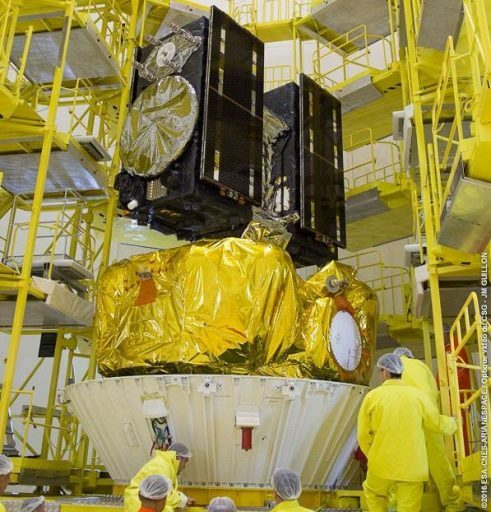 The Galileo FM-10 and 11 satellites – named Daniele and Alizee – were delivered to French Guiana in early April coming from their manufacturer OHB in Bremen, Germany. Heading from Europe to South America aboard a 747 cargo aircraft, the two satellites completed the last leg of their journey via road transport. Arriving in a clean room at the launch base, the two satellites were unpacked and completed an inspection ahead of stand-alone testing and a fit check atop their launch dispenser that allows the two satellites to ride into orbit side by side. The two 715-Kilogram satellites finished fueling for flight in early May and their installation on the payload dispenser was completed on May 10/11. 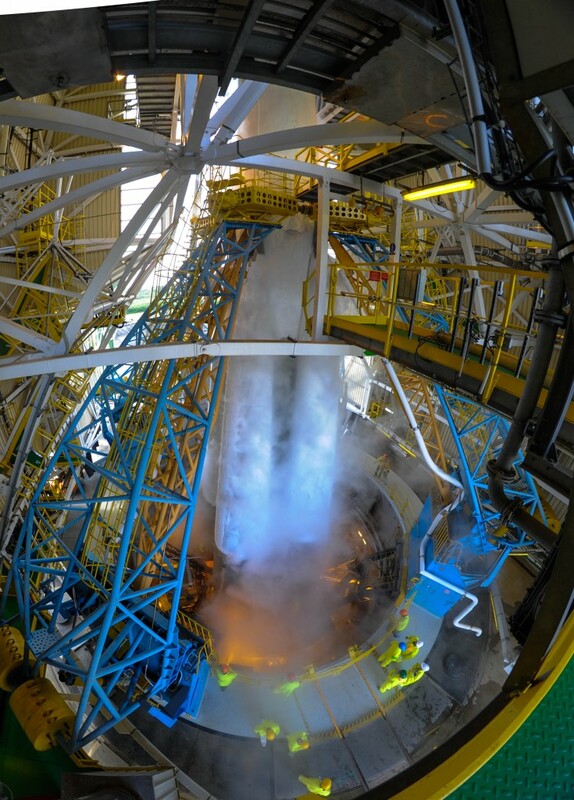 While work on the satellites was still underway, the Fregat-MT upper stage in use for this launch finished its dedicated processing campaign at the purpose-built FCube facility where Fregat received its Hydrazine Reaction Control System propellant and main propulsion system propellant components, Unsymmetrical Dimethylhydrazine and Nitrogen Tetroxide plus Helium pressurant gas. Fregat met its two passengers for the first time last week when the payload stack was installed atop the fully-fueled upper stage. Next, the Orbital Unit was encapsulated in the protective payload fairing, marking the last time the two satellites could be seen on prior to liftoff. 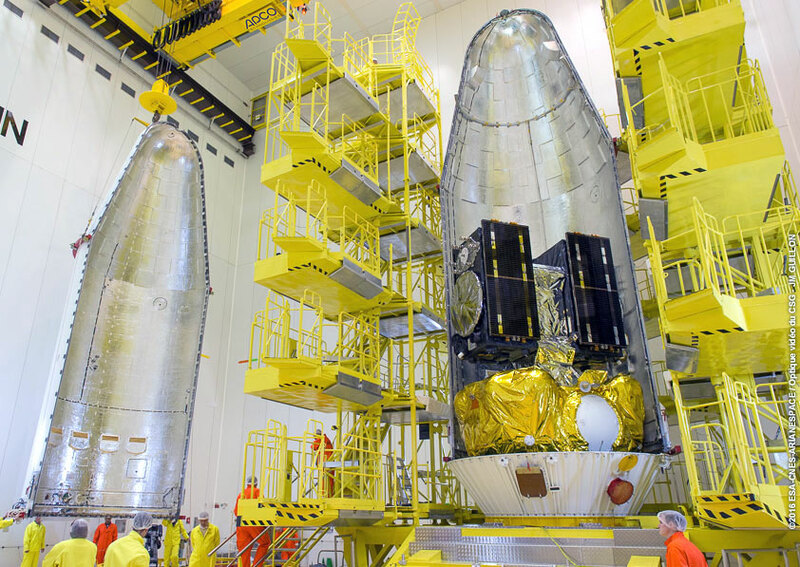 The Soyuz ST-B rocket for this flight completed assembly in the weeks ahead at the MIK processing facility. Work included the installation of the four 19.6-meter long boosters on the 27.6-meter Core Stage ahead of the integration of the Block I third stage. In its ST-B version, Soyuz uses the well known design that has been flying for decades, though has been modified to improve the performance of the vehicle by introducing a new third stage with structural improvements and an upgraded closed cycle engine along with modern digital flight control systems. 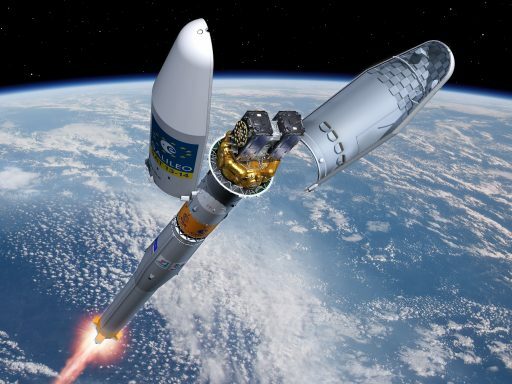 When flying from French Guiana, Soyuz includes further changes to allow it to deal with the climate at the equatorial launch site and an explosive Flight Termination System – not used in missions from Russian Spaceports – is added to the 46-meter tall rocket. Soyuz ST-B, outfitted with a Fregat-MT upper stage with enlarged tanks, can lift up to 1,645 Kilograms to Medium Earth Orbit, making it just powerful enough to launch a pair of Galileo satellites. Soyuz emerged from the MIK assembly building on Friday and was moved over to the ELS Launch Pad where it was placed in its vertical launch position, held in place by four support arms. The Mobile Service Gantry was moved in position over the vehicle, permitting the payload stack to be rolled out and hoisted atop its launch vehicle to complete the assembly of the Soyuz. With structural and electrical connections in place, the assembled launch vehicle went through a countdown and launch simulation over the weekend. The first step of the countdown is the activation of the Soyuz launcher for pre-launch checks while teams at the pad complete final hands-on tasks such as the installation of batteries on the Soyuz, the removal of protective covers from the launcher and close-outs of the rocket and service structure. Pending approval from the Russian State Commission, propellant loading on the Soyuz will begin four hours ahead of liftoff. Over the course of the two-hour propellant loading sequence, the boosters, core stage and third stage of the Soyuz will receive a total of 272,140 Kilograms of -183°C Liquid Oxygen oxidizer and Kerosene fuel. For launch, Soyuz is also loaded with liquid Nitrogen for booster and core stage tank pressurization and Helium to serve the same purpose on the third stage of the vehicle. After fueling and final launch system tests, the rocket is exposed by retracting the Mobile Service Structure at L-60 minutes. Launch Command Power is activated at L-30 minutes and the spacecraft are switched to internal power 18 minutes ahead of liftoff. Ten minutes before launch, the final pre-launch status check is performed. At the same time, the Soyuz Inertial Guidance System is activated and on-board recorders become active. At L-8 minutes, the final GO for launch is given before the countdown heads into the Automated Sequence six minutes before liftoff. Six minutes ahead of T-0, the Soyuz Automated Countdown Sequence starts during which the launcher is put through its final set of reconfigurations for blastoff. The ground and onboard telemetry systems are activated at T-5 minutes and launch enable is switched to flight mode. Starting at T-3 minutes and 15 seconds, the RD-107A and RD-108A engines of the boosters and core stage are purged with gaseous nitrogen to condition them for ignition. The payload umbilical is disconnected at T-2:40 and propellant tank pressurization begins at T-2:35 as all 12 tanks of the Soyuz are pressurized to flight level. Propellant Drain & Safety Valves are closed and the onboard measurement system is activated. One minute before launch, Soyuz switches to internal power and the Auto Sequencer assumes control of the vehicle. 40 seconds before launch, the third stage umbilical is disconnected and the umbilical mast retracts to its launch position. Liftoff is set for precisely 08:48:43 UTC on Tuesday. Blasting off with a total liftoff thrust of 422,000 Kilograms firing the four RD-107A and single RD-108A engine, Soyuz begins its ascent with a short vertical climb before pitching and rolling onto its pre-planned flight trajectory. 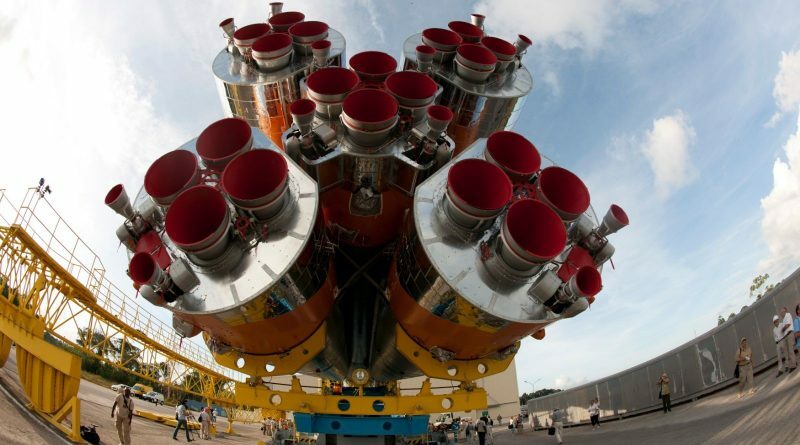 Each of the four boosters of the Soyuz is 19.6 meters long, 2.68m in diameter holding 39,200kg of propellants that are expended during a 1-minute 58-second burn. Upon burnout of the Boosters, they are separated, headed for a crash landing 350 Kilometers downrange in the Atlantic Ocean. After Booster separation, the Core Stage continues to fire its RD-108A engine providing 101,000 Kilograms of vacuum thrust. The Core is 2.95 meters in diameter and 27.8 meters long with a propellant load of 91,100 Kilograms used up over the course of a 4-minute 46-second engine burn. Soyuz uses a hot-staging technique: Two seconds after Core Stage Cutoff, the third stage ignites its RD-0124 engine and the separation system is initiated at the same time allowing the exhaust of the third stage to push the spent core stage away. RD-0124 is an upgrade to the RD-0110 used on the upper stage of the Soyuz 2-1A and the older variants, switching from an open to a closed cycle to increase the engine’s performance in terms of specific impulse. The engine will burn for four minutes and 29 seconds targeting a sub-orbital insertion trajectory. Nine minutes and 24 seconds into the flight, the Fregat will be released by the third stage of the Soyuz that will then perform an avoidance maneuver by opening an oxygen valve on its side. For Fregat, the mission begins with a one-minute coast phase. Fregat-MT is 3.35 meters in diameter and 1.5 meters long capable of holding 7,100 Kilograms of Unsymmetrical Dímethylhydrazine fuel and Nitrogen Tetroxide oxidizer. Fregat is an autonomous Upper Stage that is equipped with its own power, propulsion and control system to perform flights of up to 48 hours. S5.92 is operated in two thrust modes – 2,025 Kilograms and 1,430 Kilograms. After a very short coast period of just one minute, the Fregat Upper Stage ignites its S5.92 engine to boost the stack into a Parking Orbit. 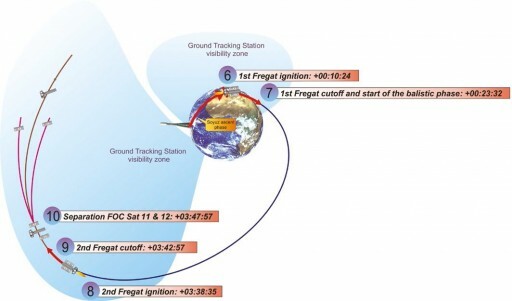 Performing a long burn of 13 minutes and eight seconds, Fregat will boost the stack into an elliptical transfer orbit with the apogee already matching the target altitude above 23,000 Kilometers. Following completion of the first Fregat burn, the stack will be coasting for three and a quarter hours to climb all the way up to apogee so that the second upper stage burn can raise the perigee and circularize the orbit. The second Fregat burn is planned to commence three hours and 38 minutes into the flight and last four minutes and 22 seconds. Galileo FM-10 and FM-11 are targeting an insertion orbit of 23,222 Kilometers at an inclination of 57.4 degrees. Spacecraft separation is planned at T+3 hours 47 minutes and 57 seconds as the two spacecraft are released simultaneously, being deployed into opposite directions to prevent a collision of the satellites. Following orbital insertion, the two spacecraft will complete a series of pre-programmed steps that include the deployment of the solar arrays, the acquisition of a stable three-axis orientation and the initiation of communications with ground stations. The spacecraft will complete several days of initial testing before heading into commissioning and starting to transmit navigation signals for further testing. Fregat will finish its mission with two small engine burns that move it into a disposal orbit for passivation.